How Do I Make these Dress Closures? Does your pattern tell/show you how do make them? Maybe if you google different dress closures you might find them. They are just fabric "tubes". The reason they are so sturdy is because they are do skinny. You can buy a tool for turning the fabric right-side out after sewing. Because they are so tight, do not make very long tubes to turn, maybe just long enough for two closures. Just practice and you should be able to get it right. Does your pattern not say? Or maybe you're one of those talented people who does not need a pattern. Lucky you! 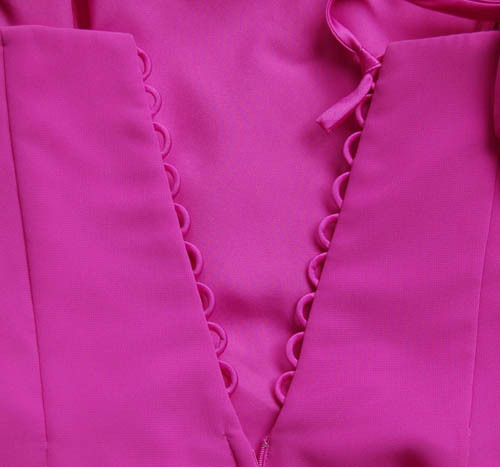 My daughter made her prom dresses in high school and one of them had loops like this, self-covered buttons and piping that she had to make. I don't remember how they were made but I would go to the fabric store, find some patterns that have the loops, sit down with them there and read how to do it. I don't remember that it was too difficult or she would have called me to check it out. But then again, it was 10 years ago and you know the mind starts failing with age. If all else fails, find a dressmaker in your area who will take the fabric and make the piping for you. There are special attachments on those expensive machines they use that can do it easily. You can then finish the dress yourself. Cut a long strip of the fabric, on the bias, fold right sides together and sew a tube. To turn right side out, attach a strong thread (i.e. embroidery silk) to one end and thread it through the eye of a blunt darning needle. Feed this into the tube and, with care you should be able to turn it completely right side out. The loops are formed with one continual 'tube'. create a curvy 'zig-zag' as you pin it down the edge of the garment seam line (form the loops around the barrel of a pen or something to ensure the loops are equal in size), overlapping to ensure it is sewn firmly (wrong side of fabric). A facing fabric would then be placed over the top and all layers sewn together and finished neatly. I hope this helps? It would have helped with diagrams! lol. I have just realized that I could draw some diagrams, scan them and upload them, so get back to me if you still can't figure it out!